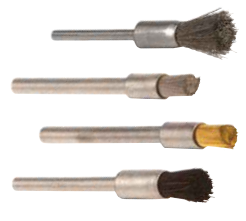 Our Miniature Brushes are available in End brushes, Cup brushes and Wheel brushes, all designs permanently mounded to a steel stem for quick installation in portable and flexible tools. 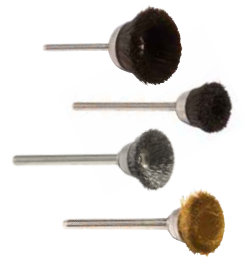 These brushes are constructed with perfect balance, longer brush life and uniform wear around the brush face. The ferrule and stem are a one-piece construction to ensure no separation during operation. 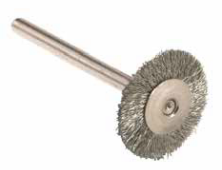 We offer standard brushes with carbon steel, stainless steel, brass and bristle fill in various sizes, diameters and lengths. Suggested applications include light deburring, blending surfaces and deburring.